Introducing Alice TodHunter Moon, a Magykal addition to the world of Septimus Heap! 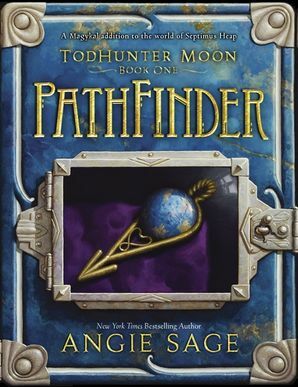 Perfect for both established fans of the Septimus Heap series and readers coming to the world of Septimus Heap for the first time, PathFinder is the first book in the Septimus Heap spin-off series, TodHunter Moon. Taking place seven years after the events of the original Septimus Heap series, PathFinder tells the story of Alice TodHunter Moon, a young PathFinder who leaves her seaside village in search of her friend Ferdie. Rumor has it that Ferdie has been taken by mysterious creatures called Garmin under orders from the malevolent Lady. Full of Angie Sage's characteristic humor and heart, PathFinder introduces a new cast of young characters—and a new kind of Magyk. All the beloved characters from Septimus Heap are here, too—Tod receives help from ExtraOrdinary Wizard Septimus Heap, ex–ExtraOrdinary Wizard Marcia Overstrand, and Alchemist Simon Heap. A great addition to any fantasy reader's library!